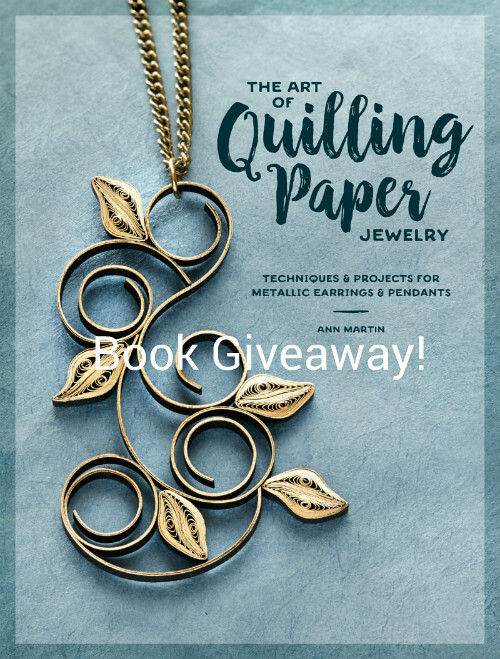 The Art of Quilling Paper Jewelry - Book Release and Giveaway! Congratulations to the giveaway winners, Stoney Creek Arts and Kristie Hendon! Thank you all for your enthusiastic entries. If you're on the fence about whether you should try quilling, have a browse through the comments... you just might be persuaded what a great hobby it is! Lo and behold, The Art of Quilling Paper Jewelry is here! Yes, it arrived a few weeks early and is now available wherever books are sold. 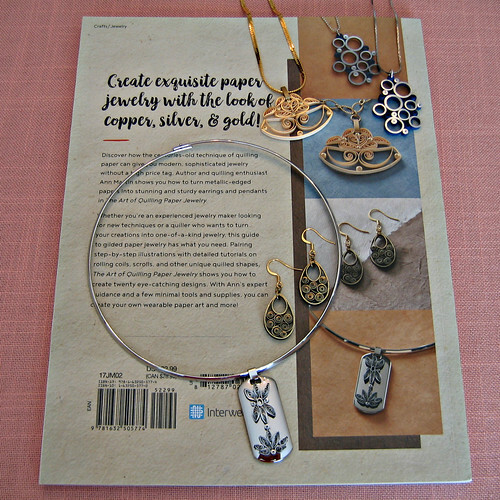 Whether you are a long-time quiller or have had it in mind to give paper shaping a try, you'll find inspiring projects to launch you on the path of creating gift-worthy necklaces and earrings. The modern designs range from quick and easy to those that aren't difficult, but simply more time-consuming (once you have learned the technique and practiced for a bit). Most of the projects can be made in an evening... my favorite kind. How nice is it to wake up the next morning knowing you have something new and pretty to wear that day?! 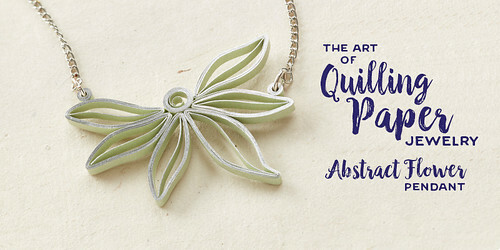 I've said this before, but there are so many reasons to love quilled jewelry... it's surprisingly lightweight, yet durable, not to mention a guaranteed attention-getter. If you're ever at a loss for something to talk about when meeting someone new, just wear a piece of quilled jewelry and ask if the person can guess what it's made of... works like a charm to get conversation flowing! Here I've placed the back covergirl pieces next to their images so you'll have a good idea of the size and shine. All of the projects were made with metallic-edge paper because it truly makes quilled jewelry look like metal. However, plain quilling paper looks great too, and comes in every color of the rainbow. Each project includes a Materials and Tools list, detailed step-by-step instructions with excellent illustrations, a beautiful close-up photograph, and finished size measurements so you'll know exactly what to expect before getting started. To purchase the book, visit your favorite bookstore... if it isn't in the Craft - Jewelry section, ask them to order it for you. You'll find it online at Amazon, Barnes and Noble, Book Depository (free worldwide shipping), and the Interweave Store, which offers it as an eBook, as well as the print version. Also check your local library... if they don't have it, they will often be happy to get it for you. I'm already starting to see photos of jewelry that people have made from the book - so much fun! If you'd like to email me pics of quilled jewelry that you create - either projects from the book or inspired by them - please do. My address is ann.b.martin@gmail.com. I'm sure I'll be sharing at least some of the photos in an upcoming post. 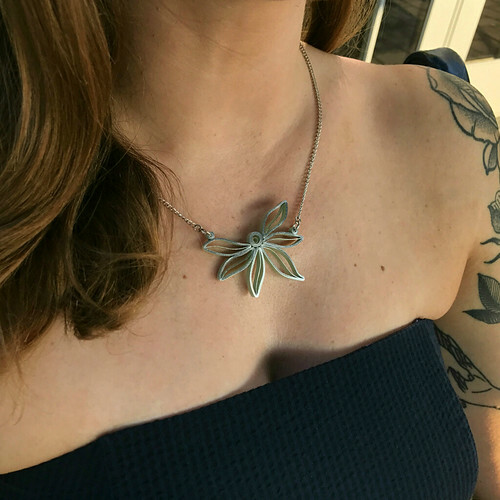 To go along with the book release, I designed a bonus project, Abstract Flower Pendant, that you'll find on the Interweave blog. Like all of the book's projects, it includes detailed, illustrated instructions to give you a taste of the twenty designs you'll find within the book's 144 pages. There's also a PDF download to print out and easily refer to while you quill. 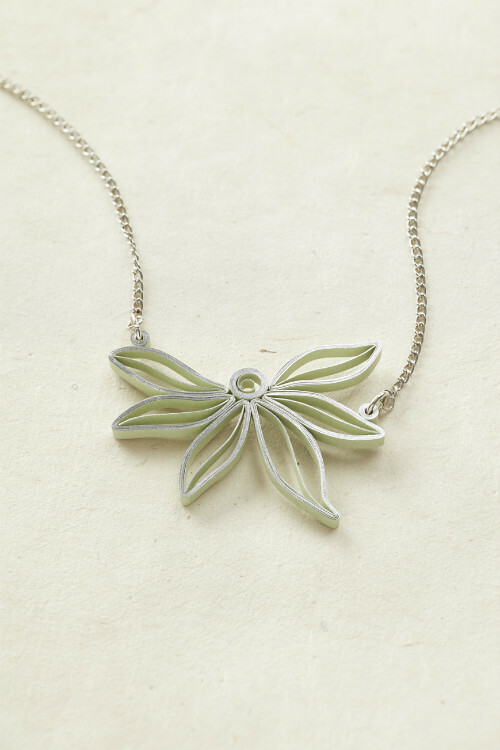 I created the example with silver-edge moss green strips that are manufactured by JJ Quilling Design in England. This type of strip is available in a variety of colors and has a fine line of shiny silver, gold, or copper applied along one edge. The strips are readily available in the U.S. from three suppliers: Custom Quilling, Quilling Supply, and Whimsiquills. You can shop with confidence at all four sites. A separate, but identical giveaway is underway on Instagram. You may enter both places to double your chances by the end of Saturday, September 2, 2017. A total of four winners will be chosen at random from all entries, notified, and announced here and on Instagram. Good luck! That is beautiful work, Marie. It rather fills in the shapes I wish I could do with tatting. My sister does quilling. She does poster sized things, tiny cards, and even free standing pieces. I know she'd love to have this book, as she enjoys the craft so much, she'd like to show it off all the time. I started quilling when I was a teen, years ago! 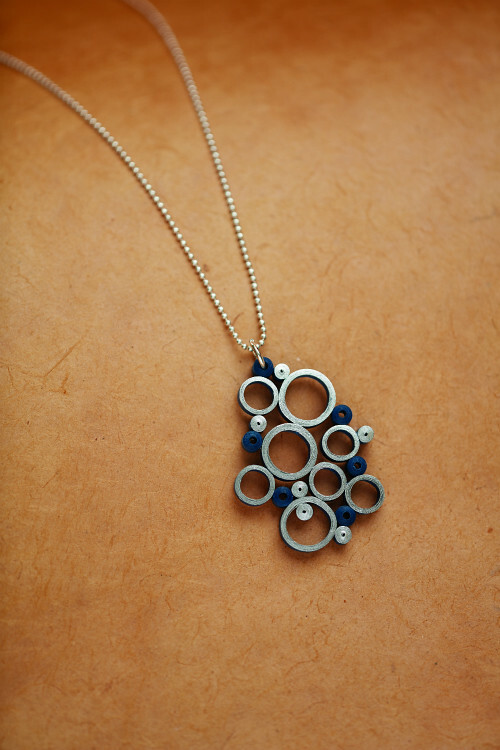 I love the delicate look of quilling and in jewelry, I love that it is light to wear. Your designs are wonderful! Janine.rudnick@gmail.com. I love how quickly a project comes together with quilling. I love tiny, time consuming projects. I initially found quilling through the art of Yulia Brodskaya and was determined to learn how to do it! I'd love to win! My email is yarrowpyxie at gmail dot com. Quilling makes me calm and patient. 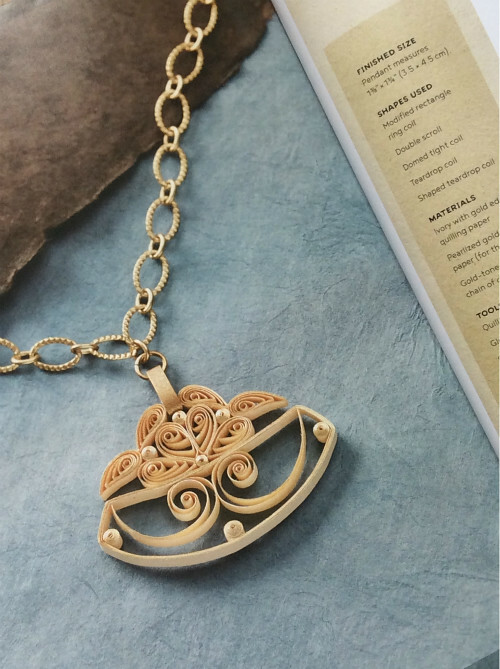 Would love to try some elegant jewelry from your book. L-lovely. No matter how you do it, the result is always lovely. L- labouring. It can keep you working hard for hours or days if you have the patience and zeal for it. I-innovative. It has been an innovative art form with a lot of originality in every pieces. N-narrative. Every piece has a story to narrate if you ask the artist. G - global. This art form has a beautiful global presence that crosses boundaries of all kinds and brings artists together. Unlike other art forms, paper quilling is unique yet so much similar anywhere you go! And it is for these reasons that I am in absolute love with this art form! It has no limits and the pieces can be as small or as big as you can make them! Learning from another blogger's experience through her book would make me feel honored and excited! I started Quilling couple of years ago. Quilling is my relaxing purpose. I like Quilling because with Quilling you can make anything just you have to imagine. I love quilling so much that I will be teaching a beginning class at my local Senior Center to over the age of 60 people. I also make jewelry using paper beads and I would love to incorporate quilling and my paper beads into an unusual product. Thanks for interest in my entry. I love the art of quilling and have been making jewelry with the same for about 2 years now. I customize jewery to match the outfit. There best part of making quilled jewelry is that the options are unlimited. With paper strips àvaible in a variety of shades, the imagination can just run wild. Thanks. I love quilling because of its versatility and ease of making something relatively quick and easy. You can start small, and work up to bigger projects, and the supplies are readily available for a very small investment - not many crafts can claim that! I have always enjoyed creating jewelry but learning quilling has allowed me to take the jewelry making to a whole new and unique level. 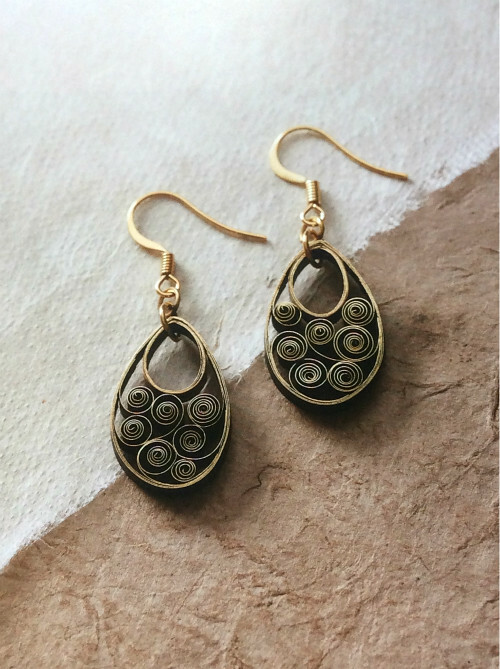 There is nothing as satisfying and relaxing as quilling jewelry. I don't do this yet, but I would love to learn. I love how it looks like filigree, but is something that I can learn to do with affordable materials. And how detailed the pieces can be. Your jewelry is so lovely! I haven't done any quilling since I was a kid in the 70s, and the style was SO different back then. I'd love to learn how to make jewelry like this! Thanks for the giveaway! I just started quilling this year. My passion is to learn to make jewelry which is why I'd love love to win your book!! I love how taking a tiny piece of paper and twirling it up can create such awesome big things! I started quilling last year when my mom sent me a kit her neighbor was getting rid of. I have a lot of anxiety issues with my homework and have trouble concentrating during video lectures. Quilling has helped me be able to concentrate better and it helps me relax and unwind when I'm having anxiety. I also really like seeing people's reactions when I give them things I've made. It's fun. Thank you for doing this book. There are just not enough good quilling books out there. I have been quilling for about a year. Just started dabbling in jewelry. Love that I can just pick up some paper, if I have an hour or just ten min. and add to an on going project. Very therapeutic. What do I like best about making jewelry? Getting to wear it and when people say "oh, where did you buy that?" I get such a kick out of telling them I made it. I have been Quilling for about 4 years. I like that you can go large or go small. I have learned a lot through YouTube videos. I have taught several classes recently. It is relaxing for me until I have to put away supplies...I still haven't figured out a good storage system. I LOVE quilling and have been creating with it for about two years. I've mostly made Christmas Ornaments - snowflakes, small snowmen, etc. However, I've also made a 5" hummingbird and some butterflies! Just gorgeous jewelry. I have never seen anything like this. I have never tried it but I have lots of paper and would love to. Congratulations, Ann. Looks like a wonderful book. Wow, just wow! It is always unusual and different beauty in paper form. Would love to have instructions to try my hand. THANKS! I love seeing people's faces when they see the beautiful quilled jewelry I have made, that is my favorite part. Making people happy! Congratulations on the release of your beautiful book. I love quilling because of the fact that rolled strips of paper can produce beautiful & delicate end results. Not been quilling lately, but these small jewelry projects will surely inspire me to get back to it. My favorite thing about making jewelry is having something unique; I have only tried a little quilling. I am new to quilling and occasionally make jewelry. I think it would be fun to mix the two together. I love quilling- the swirls! I've been quilling for 5 years now and each year i love it even more! There are always new challenges with every custom order or project and i love to tackle them all! I love the patience and the therapeutic nature of the activity and how each and every single piece is unique even if you are creating multiples of the same design! My goal for next year is to start making quilled jewelry so this book will really help me achieve that goal! The giveaway has ended. Thank you all for your comments... it has been so much fun to read why you are interested in quilling! I think quilling and jewelry making satisfy the need to be something with my hands, which helps to quiet my mind. I find it relaxing, even when it doesn't come out right!! !....Cheryl B.